Your business will flourish if you learn a simple secret to success — be good to your staff. It’s especially crucial to do this from the beginning, during the bumpy startup phase. Recognizing the efforts and accomplishments of your employees will keep them motivated to keep on improving and delivering their best work. Imagine what would happen if you did this on a regular basis, even after your business had matured into an established enterprise. In fact, even if you realize this truth about human nature late in the game, you can still apply it. If you do, you’ll be amazed at how things begin to turn around in your company. However, one caveat when using appreciation as a management strategy is that it should be sincere. Appreciation that is not tied down to any particular activity denigrates into flattery, and flattery builds doubt and distrust rather energy and initiative. While the British Prime Minister Benjamin Disraeli is purported to court the favor of Queen Victoria by laying on flattery with a trowel, it’s not a policy that works well with most people. The Benefits of Regular Appreciation. The reason appreciation works as well as it does to motivate people is because it connects with a deep anthropological need to feel part of something bigger than ourselves. As social creatures, we want to belong to a tribe, and we feel part of that tribe when our efforts to help it survive are noticed and acknowledged. In our modern world, our tribe is usually our workplace because we spend most of our day there. From a business point-of-view, appreciation improves the bottom line. If everyone does their work better because they feel engaged, everything gets better throughout an organization. 3 Ways to Show Appreciation. This is a way of making an act of appreciation into a public event. Handing out a plaque to an executive for an exceptional effort to improve the company is the corporate equivalent of being knighted. Since the recognition is done in public and since it is done in a formal way through a banquet or award ceremony, its value is increased far more than a superior making a personal call, sending out a congratulatory company-wide email, or giving a shout out during a public meeting. When an executive is recognized for exceptional effort or rare achievement, the value of appreciation is increased. In fact, it may even be more of a motivational force than receiving a bonus in the next paycheck. 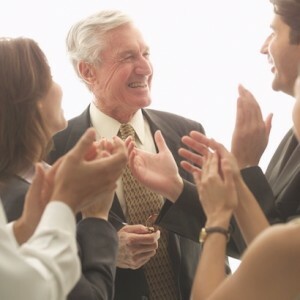 Employee awards make a top performing employee feel that they have a reputation to maintain. Other employees witnessing the award ceremony may also feel inspired to contribute more. Moreover, if the plaque is placed in “a hall of fame,” the executive’s achievement has become somewhat immortalized. Small achievements over time lead to bigger achievements. However, small achievements are often too subtle for lavish acts of appreciation. For instance, an employee may have improved how many sales they close over the course of a quarter. By acknowledging their progress, a sales manager will continue to reinforce the salespersons efforts to keep on improving their skill sets. In a meritocracy, people are rewarded for the work they do. If they do high quality work consistently, they deserve the opportunity to serve an organization in a larger capacity. A well-deserved promotion is a sign of acknowledgement, appreciation, and encouragement. Unfortunately, when it comes to promotions, the most able are not always promoted. Someone may be promoted because they have played office politics well rather than because they have contributed to the bottom line. Sometimes, too, they are promoted because of their relationship with a C-level executive or a board member. These kind of questionable promotions are a huge disincentive for those trying to rise in their careers through diligence and hard work. The Consequences of Insufficient Appreciation.